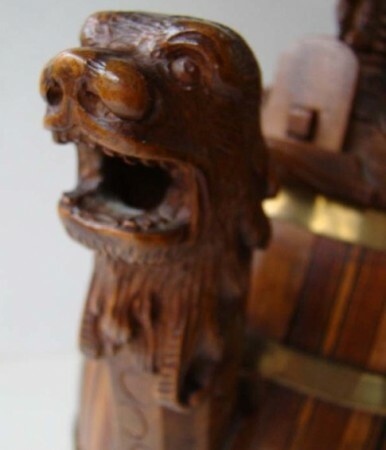 Detail of the excellent carving on the “Lock top” lid. Height 10.75 inch. Width 10 in. Austria -Hungry. Ca. 1880. These steins, vessels, etc., were all seen ‘here and there’ on “The Virginian’s” (dat be me) travels through my now 40 years of collecting. 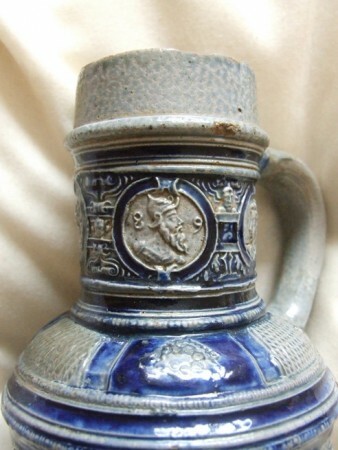 A 1/ 2 liter Raeren stoneware stein. Dated on two panels = 1566. 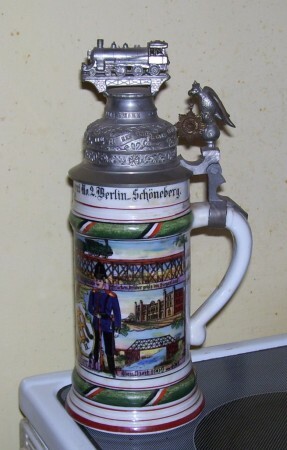 This stein might be rated a 7 (Very scarce ) on the Smith-Paratore rarity scale. Blown and enameled light green glass. 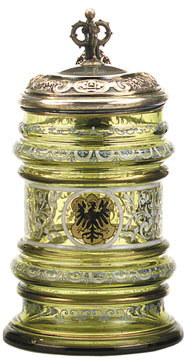 Showing the Prussian Eagle, with a .800 silver lid. A very nice looking piece. [FWTD] Unknown maker. 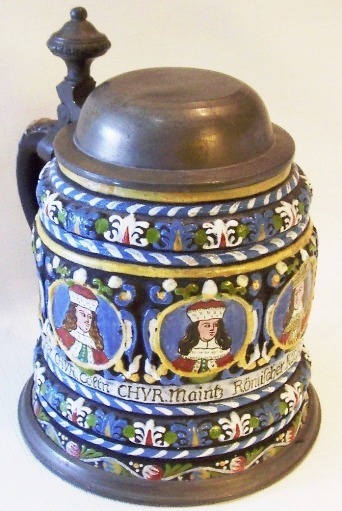 This stein might be rated a 7 (Very scarce ) on the Smith-Paratore rarity scale. 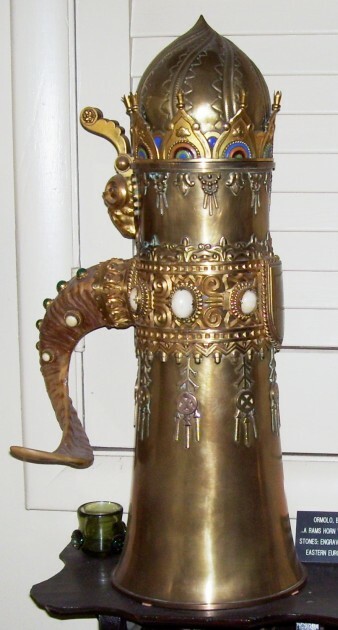 A massive 4 liter, hand worked copper serving stein from Munich and signed by S & S (Maker is unknown to me at this time, 3-2011.) Circa 1900. There is a devil’s face in relief on the front and that’s why there are goat’s hooves as feet. Notice the twisted handle and the great handle attachment work. [NON FWTD] One might rate this stein as another 7 (very scarse) on the Smith-Paratore rarity scale. A pair of 25 inch tall [!] 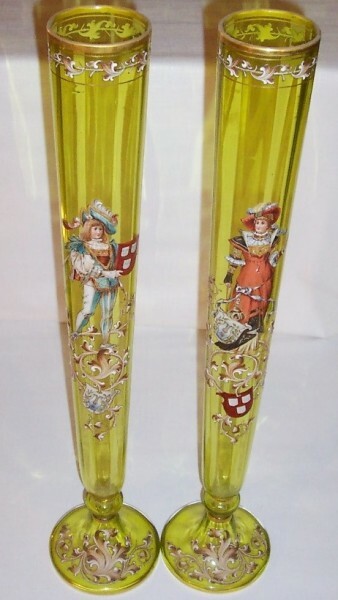 wine “flutes”, blown and decorated in enamel by Theresienthal or Riedel (by a special order), celebrating the marriage of a couple. The figures each hold their family’s coats of arms, then shown below is the other family’s. Circa 1880. [FWTD] These matched pieces might be rated a 7 (Very scarce) on the Smith-Paratore rarity scale. 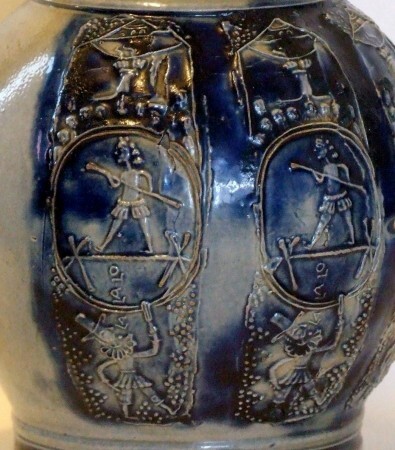 An eight inch tall Baltic (Estonian) silver coin beaker with 18 coins imbedded into the body from four separate eras / places / owners. A larger coin from the 1700’s graces the bottom. [FWTD] The earliest coins are from the 1760’s. Coin beakers and coin steins are highly collectable (and very pricey in Europe.) This silver beaker might be rated a 7 (Very scarce) on the Smith-Paratore rarity scale. 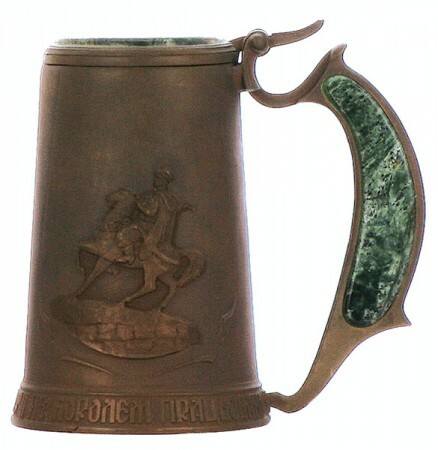 A heavy relief bronze stein from Kiev, celebrating two of the City’s famous monuments in relief on the body.The thumblift is done in a fashion where the two sides slide by each other, not seen on “German” beer steins. It also comes with Malachite (a semi-precious stone) imbedded in both sides of the handle and as the lid insert. Only one I’ve seen to date. [FWTD] This stein might be rated an 8 (Rare) on the Smith-Paratore rarity scale. 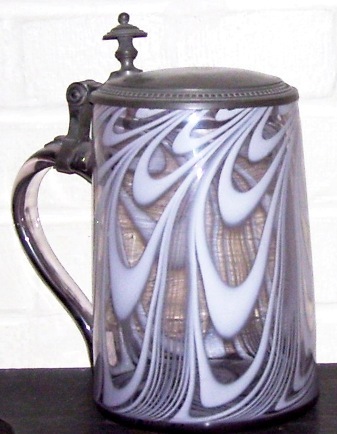 Swirled moderately smokey glass inside clear glass, with a colored base done in the same manner. Having those “saw teeth” brass mounts (they might even be heavily oxidized silver.) 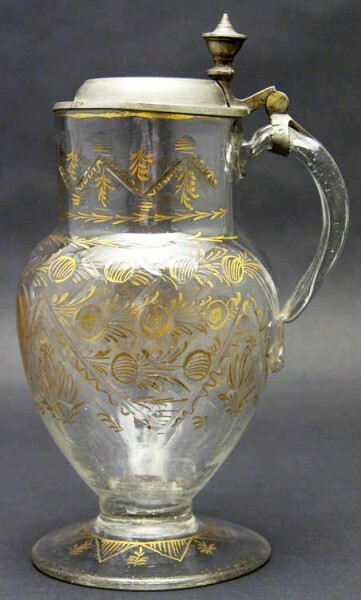 I would say this stein was made about 1780 to 1800. 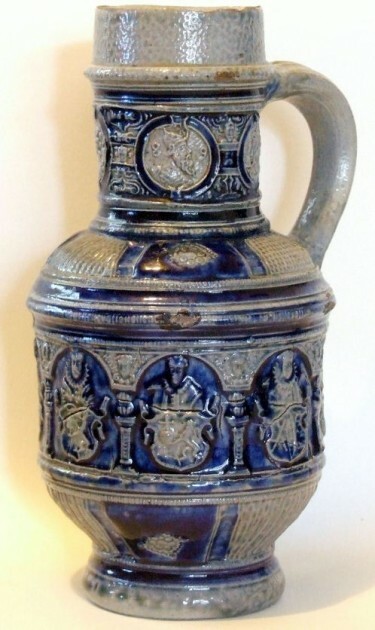 [NON FWTD] This beautiful stein might be rated a 7 (Very scarce) on the Smith-Paratore rarity scale. 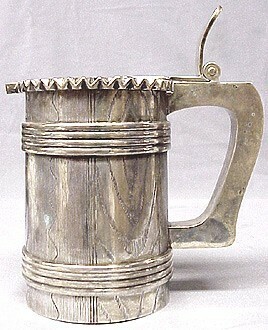 A Russian .875 silver “Keg” tankard (in the form of) , by Pavel Ovchinikov [second only to Faberge as “the silversmith” in pre-revolutionary Russia, and some say ‘as good !) Nicely done and very heavy. Assay mark: Moscow, 1908-17. 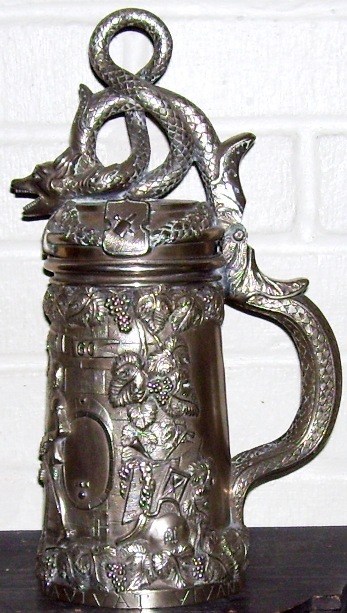 [FWTD] This silver stein might be rated a 7 (Very scarce) on the Smith-Paratore rarity scale. 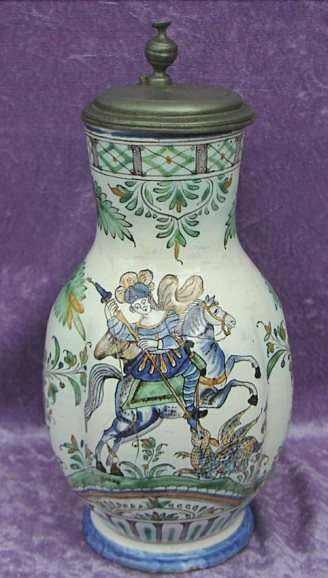 A 7.25 inch tall [x] 5.75 inch wide, hand painted relief stein marked with A. Saeltzer’s (decorator’s shop) mark. * The medieval time frame portraits are of the six of the “Electors of Germany” and the Holy Roman Emperor. 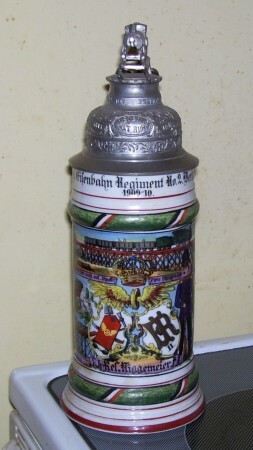 Saeltzer’s steins are always collectable. 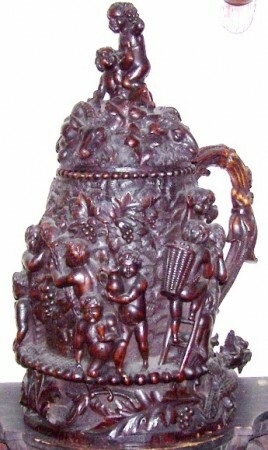 Now while there has been a catalog of these types of steins found, this is the only one showing this scene that I have seen since I stared collecting. 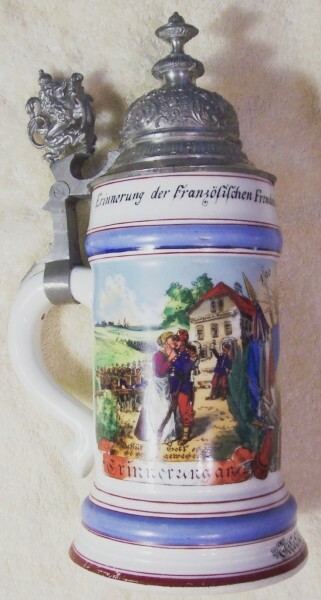 I assume the delicate hand painting, massiveness of this display stein, and the two heavy pewter mounts made the purchase cost way out of the average German’s reach at that time. [FWTD] Therefore one more reason one might rate it as an 7 (Very scarce) on the S-P Rarity Scale. 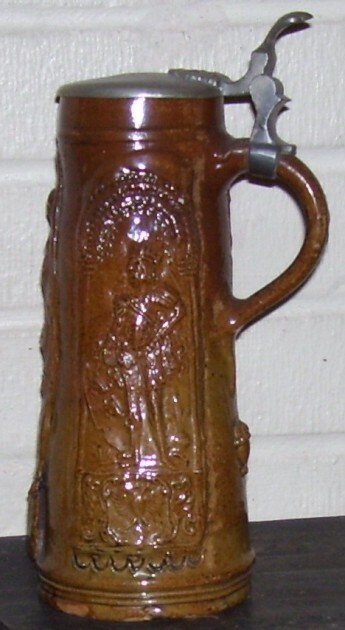 A very heavy “sand-cast” bronze beer stein. 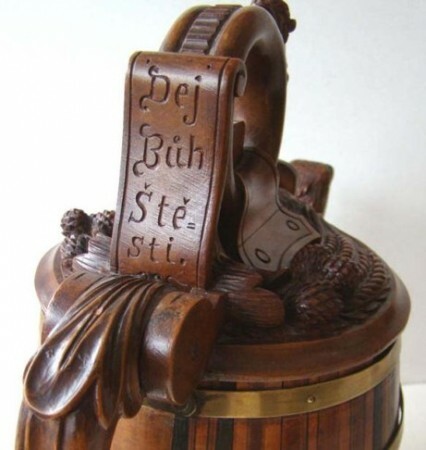 Given as a gift to college professors in 1860 for their assistance in a grape blight. The dragon has ruby eyes (not visible on photo.) [FWTD] This ‘very unique’ piece might be rated an 8 (rare) on the Smith-Paratore rarity scale. 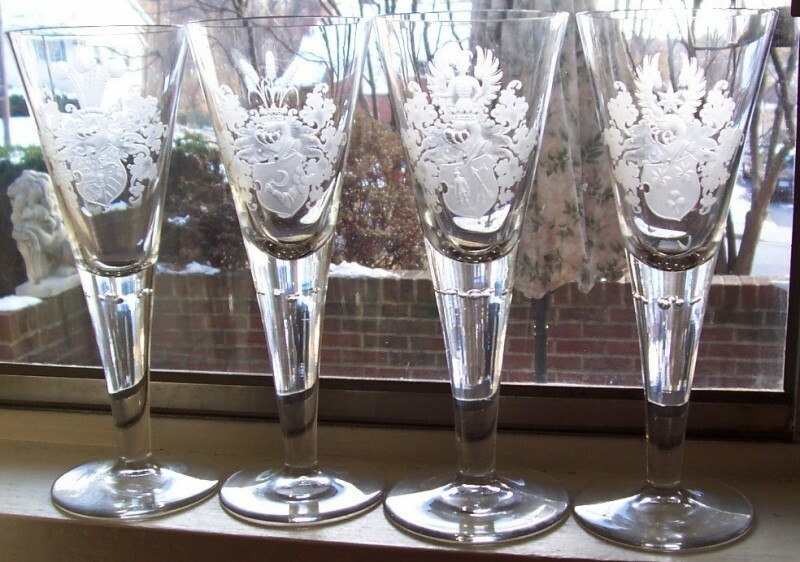 These four 10 inches high, handsomely engraved beer glasses were presents to the grandson of famous Franco-Prussian war German General, Helmuth von Moltke* They were presented from three of his buddies, all from a student dueling society which arms show on the one glass given to “von Moltke”. 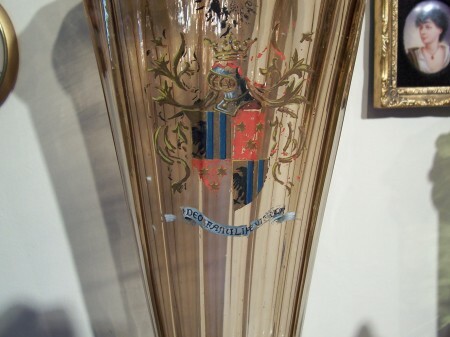 The other engraved arms shown are the student’s families. How these stayed together for that long a time and in excellent condition I have no idea. 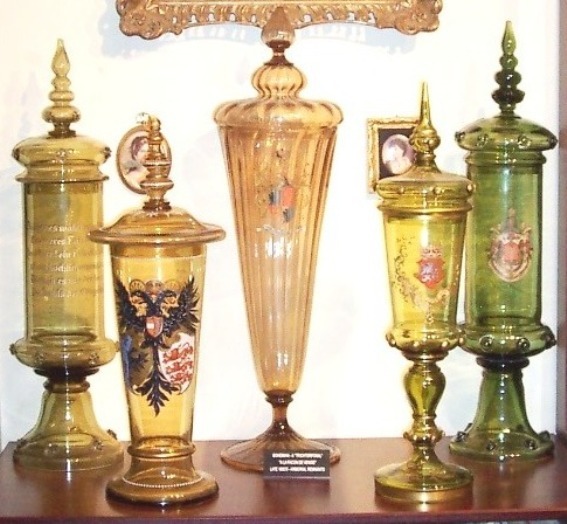 The glass maker was Josephinenhütte, Bavaria. [FWTD] Given the famous name(s) these glasses might be rated an 8 (Rare) on the Smith-Paratore rarity scale. 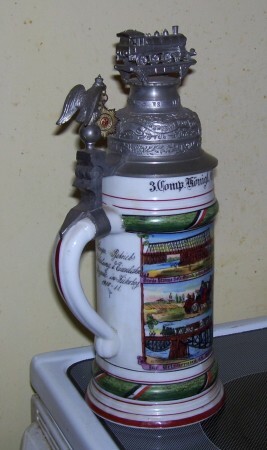 A horn “wine stein” made in the Rhine – Mosel River’s wine region of Germany. Original hand cut brass mounts with an unusual flat hinge assembly. 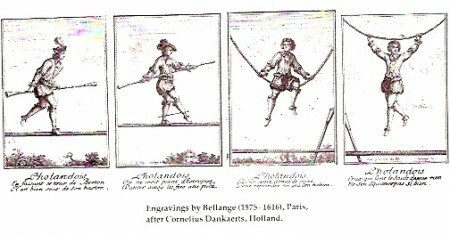 Circa early to mid 1700’s. It is in excellent condition for it age with only one wear spot. Horn steins and “drinking horns” that were used frequently did not last long. [FWTD] One might rate it as an 7 (Very scarce) on the S-P Rarity Scale. 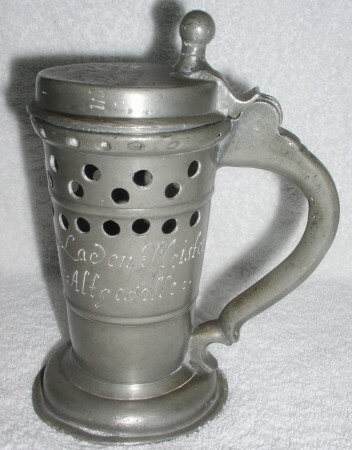 This German pewter “puzzle stein” (“vexerkrug”) [FWTD] has two engraved names on body, with blacksmith tools and items. The shop made such as horseshoes, locks and keys. 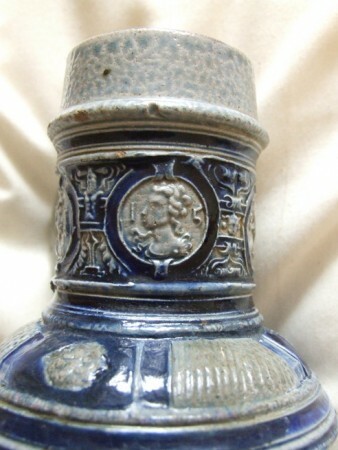 It stands 6 inches tall and is dated 1815. The verse on the stein makes it the blacksmith’s shop “Welcome Cup” also. In that context it would have been offered to customers when they arrived at the shop! These pewter “puzzle” steins are very collectable in Europe! [FWTD] This piece might be rated an 8 (Rare) on the Smith-Paratore rarity scale. The circus is situated beside the Fontanka in Saint Petersburg. 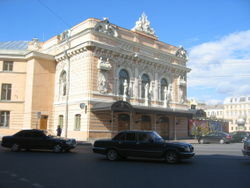 The building, which still stands, was opened on 26 December 1877, with a large stage (13 meters in diameter) and stables (housing 150 horses.) The architect was Vasily Kenel. 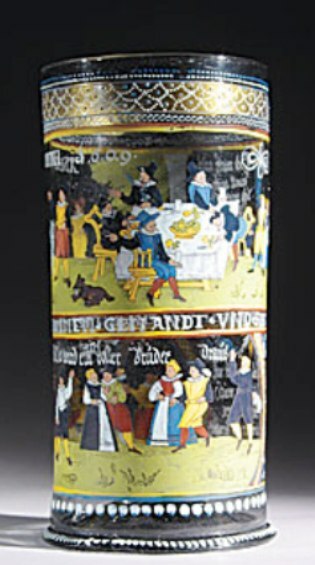 Because of this stein’s history and scene depicted, this stein might be rated as high as an 8 (Rare) on the Smith-Paratore rarity scale. The indoor circus building in Saint Petersburg. 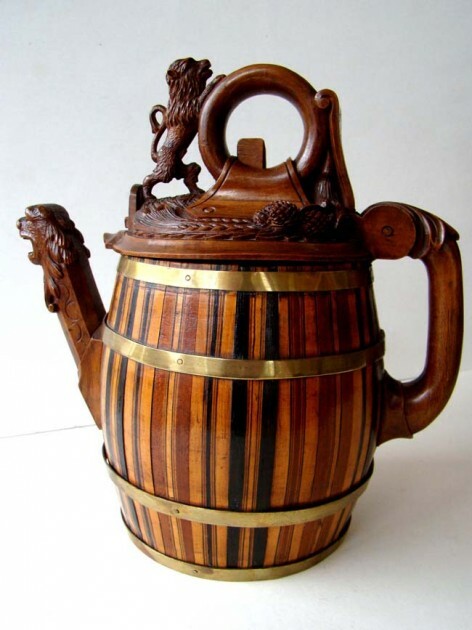 A large = 13.5 inches tall [x] 5.45 inches wide, hand carved and painted Scandinavian wooden tankard with “ball and claw” feet. 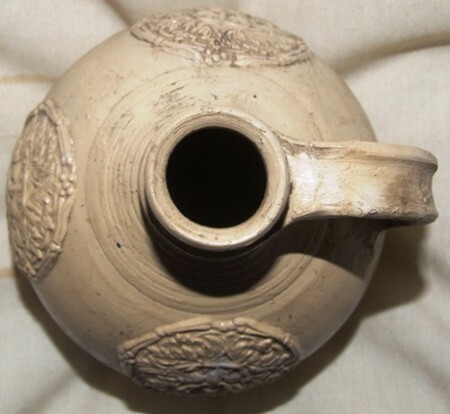 This is not a “peg” tankard. Carved body figures with a “reverse stippled” background. I’ll SWAG this to be Circa 1850. 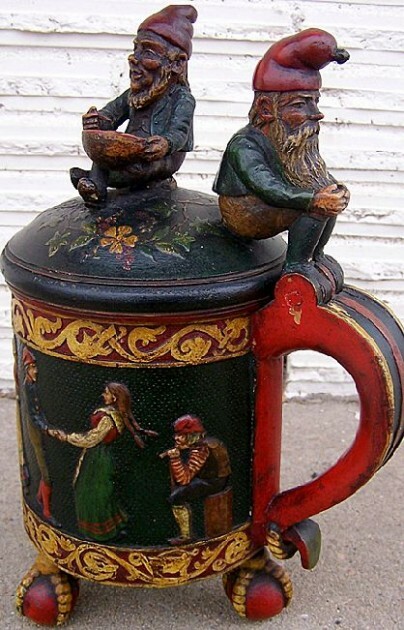 The large gnome as the thumblift may be representative of “The gnome king: Andvari.” Excellent condition. (Comps of J. Johnson = “Mr. Lucky”.) 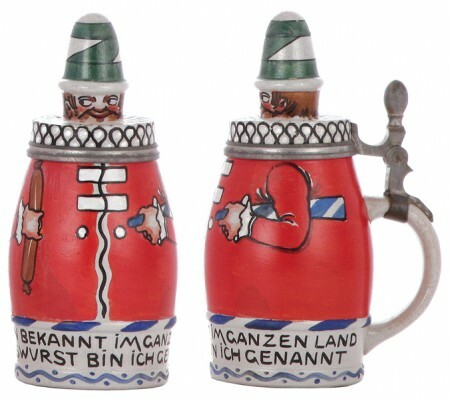 This stein might be rated a 7 (Very scarce ) on the Smith-Paratore rarity scale. 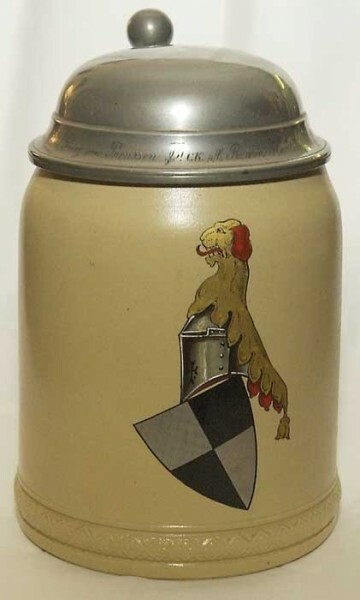 A gift from Crown Prince Rupert of Prussia, the Kaiser’s cousin, to a fellow student in a dueling society.Shown on the body is the Hohenzollern family coat of arms, with it’s unusual yellow dog’s “crest” on top of the “helm.” [FWTD] This V & B Mettlach stein with the hand painted arms and dueling society history, might be rated an 8 / 9 (Rare) on the Smith-Paratore rarity scale. An English presentation “Cup and Cover”, but hallmarked .800 sliver with German marks (probably sold through one of the big importers in London). 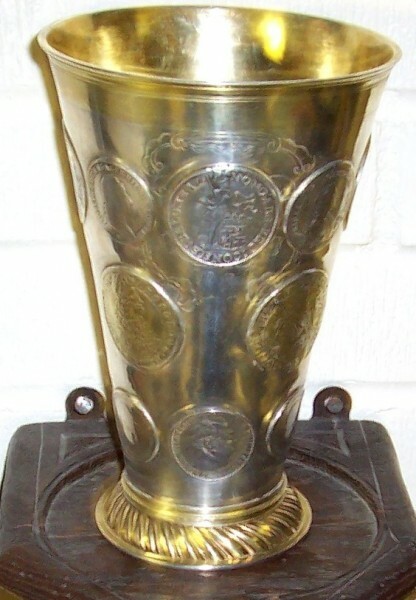 [FWTD] This 14 inch tall cup was presented to the (new) Lord Mayor of London (Antique London) from one of the prior “Sheriffs of London” that was a “Sherriff” with him. There are only two “City sheriffs’ at any one time and it is the only qualifier for becoming the Lord Mayor in the future. The Lord Mayor leads a massive parade to see the Queen every year in this little bit of “mobile artwork” shown in the photo below. As it is one of a kind and has so much history behind it, this silver “Cup” might be rated an 8 / 9 (Rare) on the Smith-Paratore rarity scale. 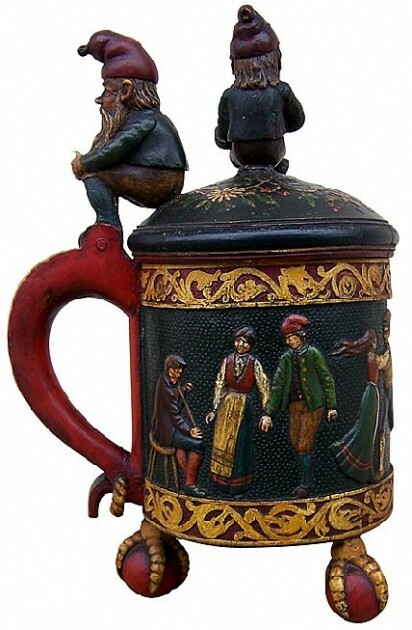 About 1 1/2 liter, set-on-lid, heavily carved wooden beer stein with “hops collecting” scenes. 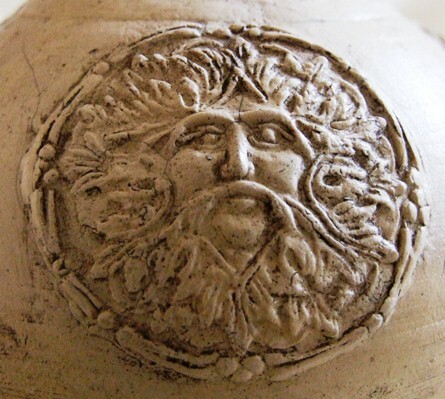 It comes with a few minor losses, but is as good a carving as on any ivory stein you could find. Circa 1800. 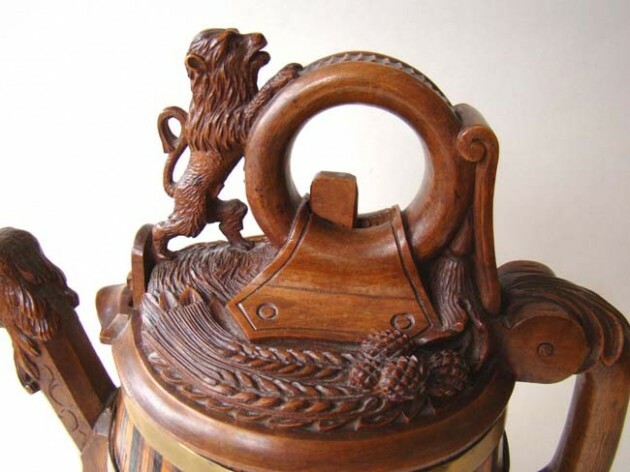 [FWTD] – [R] Detail of the carved handle. 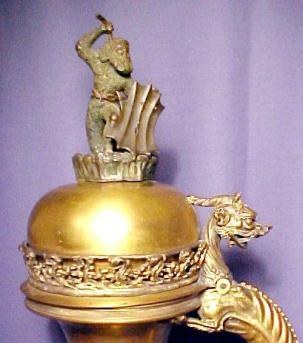 Note the devil on the handle, and the handle’s dragon head finial. 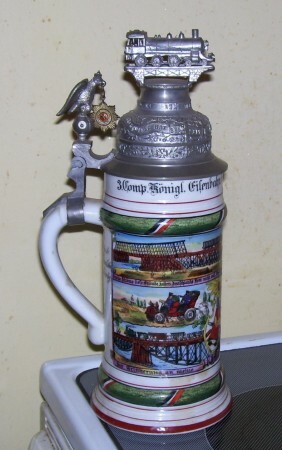 One might rate this stein as an 8 (Rare) on the Smith-Paratore rarity scale. 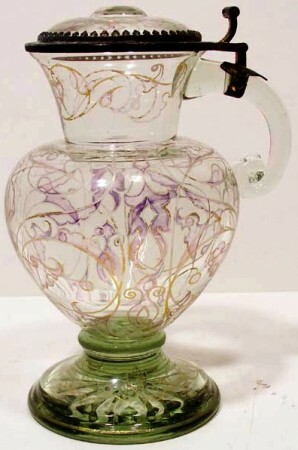 A 1.75 liter Bohemian, white glass swirled between two layers of clear glass.Circa 1820 – 30. [FWTD] One might rate it as an 7 (Very scarce) on the S-P Rarity Scale. Beaker, 8 inches tall, cased blue glass, cut to clear. German. CA 1840- 60. Josephinenhütte factory. [FWTD] Not signed. This piece might be rated an 7 (Very scarce) on the Smith-Paratore rarity scale. 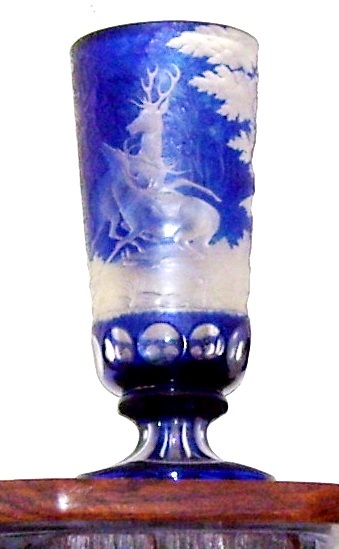 For more, see the page: “Josephinenhütte glass drinking vessels at the S. M. & T.”, on this web site. It is still undetermined where this piece was made and by whom as there is none other in the literature. I think (SWAG) because of the enameled rainbow half-roundels that go around the top (and alternate the colors between each) and all the mountain goat features that this could have been made in the region around Prague to Odessa. 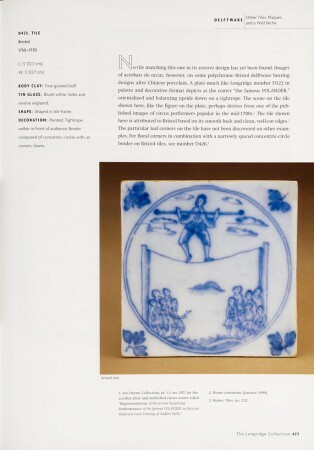 It was acquired from the Sotheby’s auction of the world famous Hausner’s German Restaurant in Baltimore, Maryland, a few years back. As far as I know, the Corning Museum of Glass does not have an equivalent example. One might rate it as a 10 (Extremely rare) on the S-P Rarity Scale! I do! Detail of rope walker in the center panel. 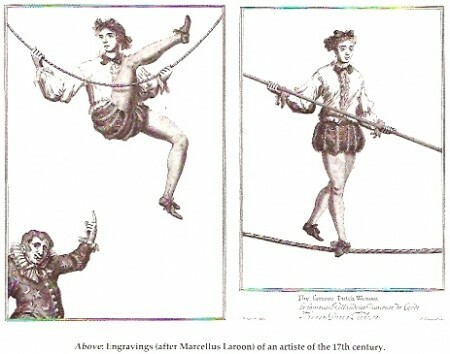 This top scene can be interpreted as  the rope walker exiting his rope walk head down on purpose; or  as I believe, he is shown falling with his arms out, right into the audience! Here is the Ringmaster with his “ruff” on around his neck (as shown on the illustration just below) shouting the words “Lo -La Lo” , ” which are upright, as if its coming from the Ringmaster’s (bottom figure’s) mouth. (All photos and illustrations are compliments of Darren Bannaghan.) 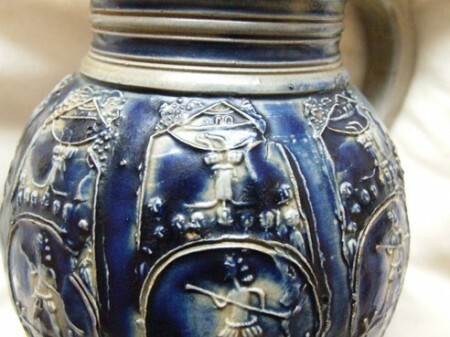 Because of this stein’s subject matter and scene depicted, this Westerwald stein might be rated as high as an 8 (Rare) on the Smith-Paratore rarity scale! 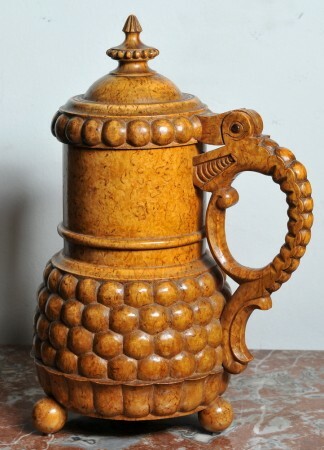 A very nice Circa 1800 tall Scandinavian / Baltic States wooden stein with folk dragon as the handle. 13 inches high. On eBay, 2-2012, and asking well over $800. One might rate it as an 7 (Very scarce) on the S-P Rarity Scale. This one would look extremely nice in the “FWTD” collection. 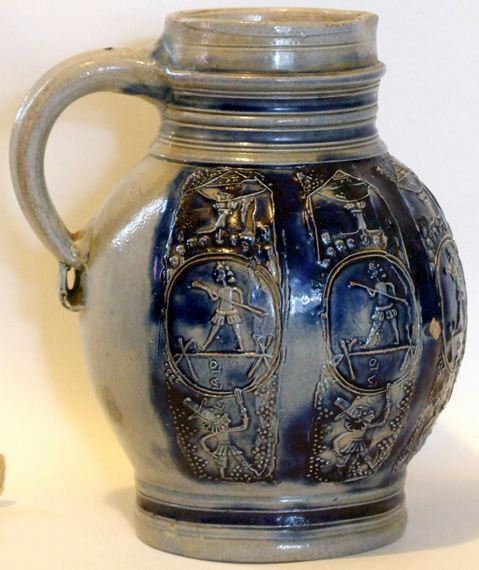 Westerwald “Holy Roman Emperor’s Elector’s jug.” Rare and dated 1589. Eight inches tall. It has the initials IE for Jan Emens Mennicken dated 1589, 15 & 89 are inside the relief roundels at the top. 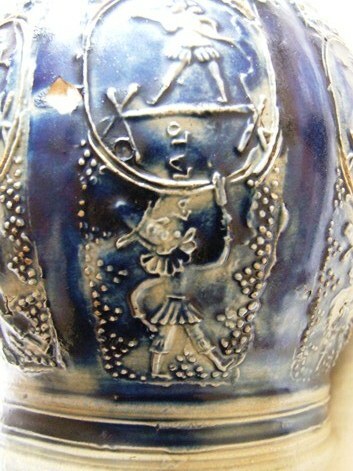 Because of the extreme early date, this jug might be rated an 8 (Rare) on the Smith-Paratore rarity scale. 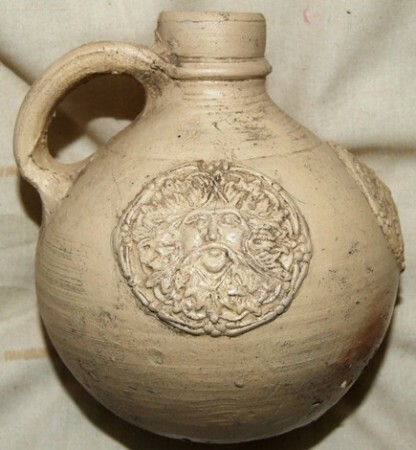 A .5 liter Austrian Fayence from Gmunden, Scene of St. George and his Dragon. 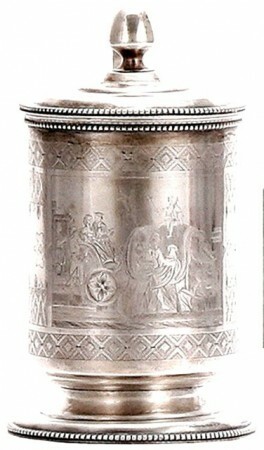 And lastly a little piece of Russian silver for S M & T. Anyone want to give me a loan until my brother straightens out ? 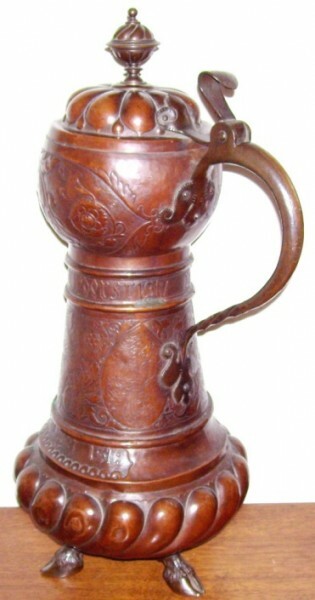 Russian silver tankard. 11.5 in. With gem set silver. Makers mark “H i T” – Moscow 1908-1915. The estimate was only £23,750 – $38,048) Those are British pounds folks! [Photo: Christies] This one should be rated over a solid “8.” (Rare) on the Smith-Paratore rarity scale. AND VIEW THE “PHOTOS FROM THE ROAD” PAGES.